This perennial thallus ranges from olive green to brown in color and 10-50 cm in height. H. californicus is dichotomously branched although it often appears irregularly branched due to axis breakage. Midribs are flattened in terminal thallus portions and paired white hairs along the mid-rib are present. Tips of branches swell up when reproductive, resulting in gas-filled, oval receptacles (Abbott and Hollenberg 1976). Locally abundant to infrequent in upper intertidal, usually at higher tidal levels but sometimes mixed with Fucus on rocks in central California. In southern California, Hesperophycus characteristically occurs at tidal elevations immediately above Silvetia, replacing Fucus south of Pt. Conception. The range of this species reaches from Santa Cruz, California to Islas San Benito, Baja California (Abbott and Hollenberg 1976). Can be confused with the other common rockweeds: Fucus gardneri, Pelvetiopsis limitata, and Silvetia compressa. 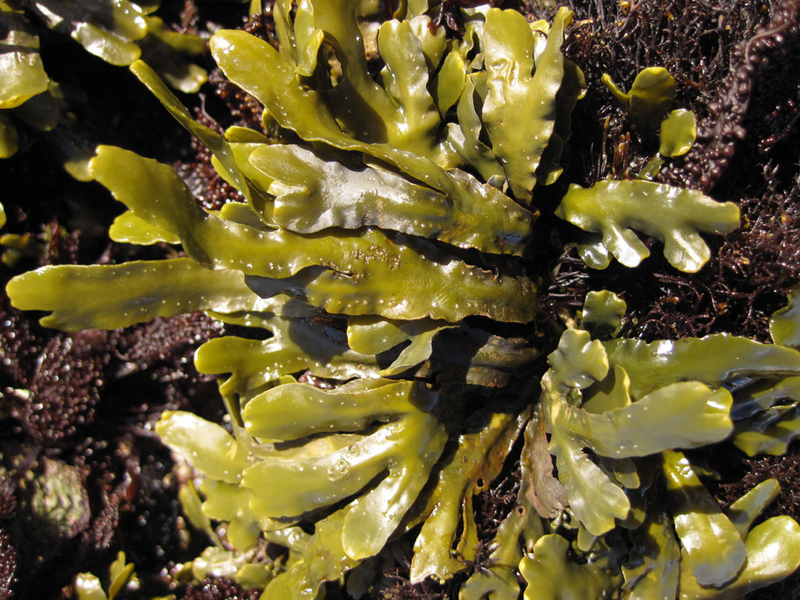 In California, Fucus has broader, less ruffled fronds and larger receptacles than the other species and, unlike H. californicus, can have unpaired white hairs along the midrib rather than paired. Fronds of Silvetia and Pelvetiopsis lack a midrib. Hesperophycus is a fairly common fucoid alga along the central coast of California, found in the upper-mid tidal regions sometimes mixed with Silvetia or Fucus (Raimondi et al. 1999). A study on Santa Cruz Island by Blanchette et al. (2000) found that H. californicus size is reduced by increased wave strength due to tattering; this reduction in thallus size may then increase survivorship by reducing drag without damaging the alga’s staying power. Hesperophycus is particularly susceptible to oiling (Dawson and Foster 1982), and is believed to have declined in abundance along the southern California mainland.